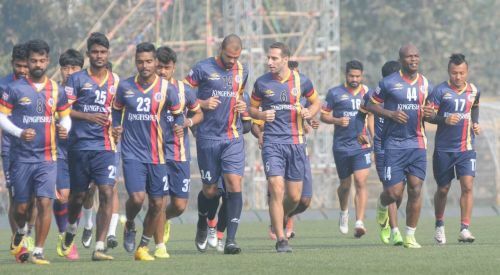 Match 63 of I-League saw Kolkata giants East Bengal play hosts to the young Indian Arrows at the Barasat Stadium in Kolkata. Khalid Jamil's side began the match on the fourth spot on the table after Mohun Bagan leapfrogged them to the third spot with a 3-0 away win in Shillong on Saturday. The perennial rivals were locked on 20 points from twelve matches but the Mariners were ahead courtesy the head-to-head advantage. Indian Arrows were in the lower half of the table with 11 points from their twelve matches. East Bengal were made to work extremely hard by Indian Arrows as they defended with grit and determination. Dudu Omegbemi's late header won it for the Red and Golds as they managed to stay in the title race. Ubaid CK (5/10) - The East Bengal custodian had a quiet evening as the home side dominated proceedings on the park. He was called into action a couple of times and looked a bit shaky with indecisiveness and lack of communication with his defenders. Lalramchullova (6/10) - The left-back for the East Bengal was active on the flank with his attacking runs. He combined well with Katsumi Yusa on the wings and made some overlapping runs behind the Arrows' defence. 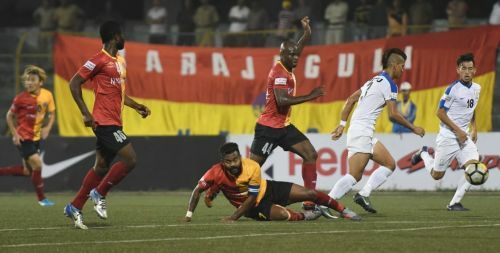 Eduardo Ferreira (5.5/10) - The East Bengal centre-back had a silent outing as none of the Arrows attackers posed much threat to the home side. Salam Ranjan Singh (5.5/10) - The former Bengaluru FC man also had a quiet day in the office alongside Eduardo Ferreira as Indian Arrows did not offer much in the attacking third of the field. Mehtab Singh (5/10) - The young right back from the East Bengal academy was busy on his flank as he kept making overlapping runs on the wings. He did well in defence against the likes of Stalin and Jadhav as well and was replaced at the start of the second half. Katsumi Yusa (8/10) - The Japanese winger was the most active attacker for Khalid Jamil's side with his incisive runs and crosses from the left flank. He was the assigned setpiece taker for the Red and Golds as well and put in good deliveries from Dudu and Kromah in the box. Cavin Lobo (7.5/10) - The East Bengal veteran was the creative nucleus in the central midfield as he dictated the tempo for the Kolkata side. He sprinkled the ball all over the pitch and even had a couple of efforts on the goal. Joby Justin (6/10) - The young East Bengal forward played up and down the pitch as he moved back to support Cavin Lobo in the midfield. He kept finding good passes for the wingers from the centre. Laldanmawia Ralte (6.5/10) - The pacey winger played on the right flank and made a lot of good runs on the wings. He kept exchanging places with Joby Justin as East Bengal played a fluid game against the Arrows. Ansumana Kromah (7.5/10) - The former Mohun Bagan footballer played behind the strikers for the home side. He was highly active and kept the opposition defenders busy with his defence-splitting passes. Dudu Omegbemi (8/10) - The Nigerian forward was a menace for the young Arrows as he almost bullied them with his physicality in the box. He had several close chances to score in the first half and even hit the post once. Dudu grabbed the winner at the death when he scored past the Arrows' keeper Gill with a looping header. Samad Mallick (6/10) - The youngster came on at the start of the second half to replace Mehtab Singh in the right-back position. He did well on the right flank as he kept making good runs and put in delightful crosses for Dudu inside the box. Brandon Vanlalremdika (4.5/10) - The youngster who scored the equaliser in East Bengal's last match came on to replace Cavin Lobo in the second half. Mohd. Rafique (5/10) - The India international midfielder was brought on by Khalid Jamil late in the match as the home side pushed for the elusive goal. His cross in the box was headed into the net by Omagbemi.